Nina Oberon's life was turned upside down when her mother was murdered and the secrets about her family's involvement with the Resistance were revealed. The anonymous challenging of her little sister's custody case sets off a string of events that put Nina in a very precarious position with the Governing Council and underground resistance, where the stakes are higher than ever. No matter what happens, Nina will have to fight to stand by the truth. 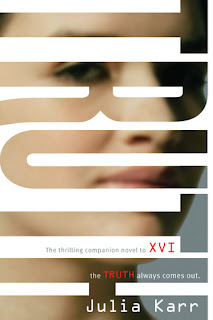 Julia Karr's sequel to her debut novel, XVI, is full of conflict, suspense, and strong themes of fighting for the truth. The custody issue and its subsequent consequences were drawn out well, leading Nina and Dee to seeking shelter with the Jenkins family. Nina is shocked at how quickly things can change, but she still stays determined to help the resistance in any way possible, even if it's just by saving Joan, a broken character first introduced in XVI. However, her relationship with her boyfriend Sal does suffer—are they really in love, or even on the same page? The issue of what's happening to their relationship when he's gone throughout most of the book (and eyed by another girl in the resistance), coupled with Nina's growing attraction to Wei's brother, make for some interesting angst. The book picks up towards the end as Wei, Nina, and friends engineer a risky escape plan for Joan that goes wrong, taking Nina to places she didn't expect to go. While some of the dialogue feels a little awkward, the story is quite solid. There are a lot of questions that go unanswered in Truth that will leave readers wondering, and the open ending indicates a third book that will hopefully clear things up and find Nina is a better place than where she's left off. Cover Comments: I like how this cover is a little bit lighter than its prequel--you can see the title and the image a lot better. Very nice. This one will be available on January 19th, 2012! Thanks for the post! It is sure to be very helpful, I was just looking for this info.